On one of my last trips back from New York, possibly from the Galaxy S4 event, I found myself thumbing through in-flight magazines in attempt to kill off some of the 6-hour flight time I would have to endure. As I typically do on flights because I find the items hilarious, I grabbed for Skymall. For the most part, I’m looking to see how insanely expensive fake Harry Potter wands have become or if the giant stone Bigfoot has come down in price, so that I could potentially convince my better half that we need it for our yard. But on this last trip, I turned to a full-page ad that included Nest, the “Learning Thermostat.” As I had heard of the product previously and found it interesting, I snapped a picture of it, so that I would remember to look up additional info whenever I made it home. This turned out to be a brilliant move on my part because the Nest is now my favorite Android accessory, possibly of all time. For those not familiar, Nest is a thermostat that you can install by yourself, in your home, in place of your current thermostat. It claims to save you all sorts of money by performing more efficiently than your current thermostat because it learns your patterns and adjusts temperatures based upon them, automatically. 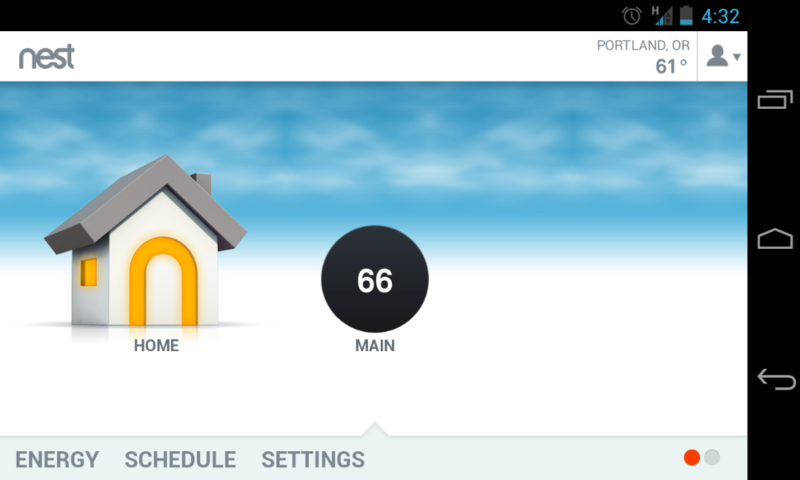 It has apps on both Android and iOS along with a web interface, so for the most part, you can control Nest from anywhere. It sports a beautifully modern design, is incredibly easy to setup and adjust, and can be used in conjunction with multiple Nest thermostats throughout your house. So why do I love it? For so many reasons. First of all, it looks amazing. It’s a simple metal cylinder with a multi-color display that rotates and can be pressed to navigate. Even if this didn’t save you any money, you should buy it because it will instantly give your house some eye-candy. But outside of looks, I love the Nest mostly because I can control it from anywhere. While I work at home, I still run in and out of my house quite frequently. Rather than having to remember to adjust my thermostat every time I leave or return, I can take advantage of Nest’s Auto Away feature which senses that I haven’t been around for a while, so it automatically shuts itself down to a preset temperature in order to save energy. As I return and walk by the Nest, it comes back to life. And even if Nest hasn’t turned to Auto Away, I can fire up the app on my phone and manually turn the system to away with a couple of taps. In all honesty, it’s pretty cool to think that lying in bed on a cold Saturday morning and deciding you want the heat on earlier than normal is no longer met with a groan. You simply reach for your phone, set the temperature, snuggle back in, and enjoy your day off in warmth. Nest has a pretty robust settings menu as well, so that you can completely customize the way it functions for your house. Nest will take the first few days with you to try and learn your schedule, but I lacked patience and went ahead and manually set one up myself. If you don’t feel like spending the time to do that, then let Nest do what it does best – learn. It’ll also let you lock the thermostat down, tell it to start heating before your preset times, set a bottom line temperature, and manage multiple thermostats. Beyond the technical stuff, Nest is simply fun to use. As you approach the unit on your wall, Nest senses that you are near and powers on to give you a chance to check the temperature and then adjust as needed. The device itself spins either direction in a circle for adjusting. It also presses in as if it were one giant button. A single press brings up the menu for Nest, at which point you can spin it to highlight features or then press again to select them. It’s as fluid as can be and feels as high-end as you would hope from a product like this. If your Nest is in the act of saving you money, you’ll see a green leaf on the screen and in your app. If Nest feels as if you had a productive and energy efficient day, it’ll reward you with a green leaf next to the entire day as you look at your Engery tab (see below). 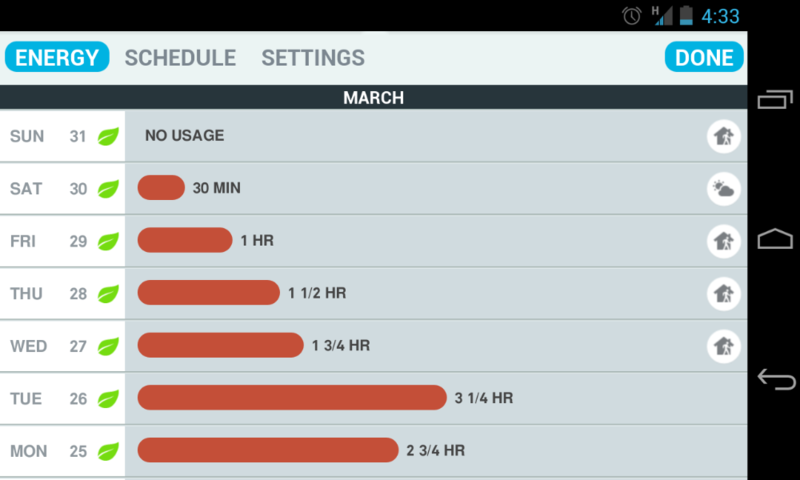 Assuming you manage to have energy efficient days on the regular, Nest should be saving you quite a bit of money. 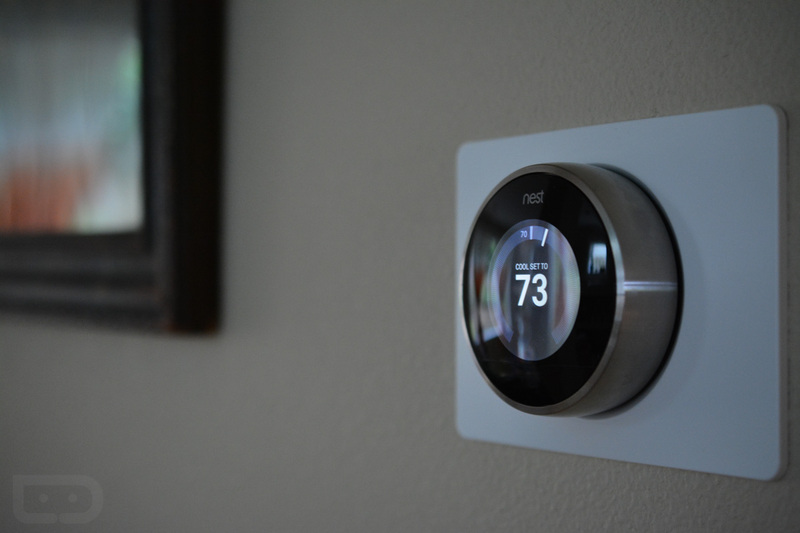 In fact, the Nest team claims that their thermostat can save you up to 20% off your heating and cooling bills because it performs that much more efficiently than your typical thermostat. I’m still in my early stages of life with Nest, so I’ll have to report back on savings later. Installation is about as simple as can be. By no means do I consider myself to be handy around the house, but even I was able to install Nest in a matter of minutes. The support site for Nest has both a compatibility checker (that’s mostly foolproof) and installation videos to help you along the way. The Nest isn’t necessarily the cheapest home accessory you’ll find, but for the reasons I listed above, it has been completely worth it thus far. And this isn’t your typical “accessory” if you will – this is a product that becomes a part of your home and should almost be considered an investment. Now, I’m just waiting to see what my heating bill looks like, so that I can justify the purchase even further. Yes, I bought this bad boy. This is not a review unit. How long before it pays for itself?